Millions of users jump from Android to iOS and vice versa. 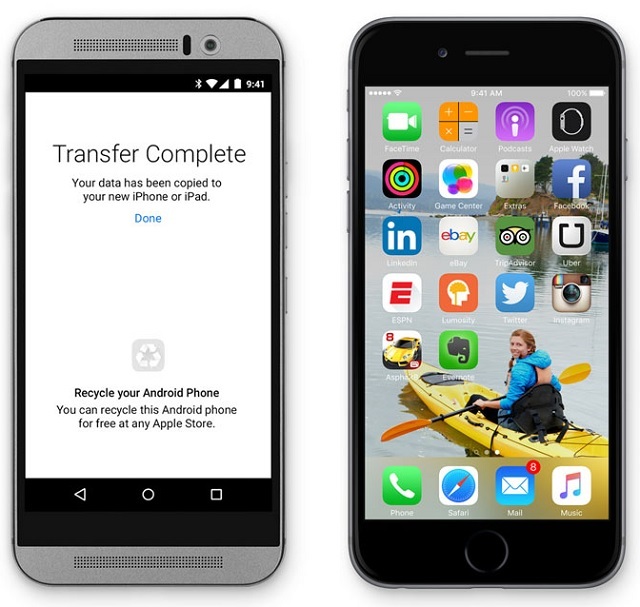 Apple has finally realized that as the company has launched a dedicated Android Migration app called Move to iOS, which makes it easier for Android users to move from an Android smartphone or tablet to an iPhone or iPad. The app allows users to securely transfer contacts, mail accounts, messages, photos, videos, bookmarks, wallpapers as well as DRM-free songs and books to their new Apple device. Move to iOS, which is by far Apple’s first for the Android platform is not limited to moving user’s data to iOS. The app also scans which free apps user had installed on his or her Android device and automatically suggests those apps on the App Store. For example, if you had app like Facebook or Twitter, which is also available on iOS for free, the app will make sure you are easily able to find it on the App Store. If an app you had installed on Android device is available on both platforms but is paid then Move to iOS will automatically add that app to your iTunes Wish List so you can purchase it later if you like. All this is done wirelessly and securely so you don’t have to worry about anything. While the Move to iOS app wasn’t mentioned during the keynote it is listed on Apple’s iOS 9 showcase page. We assume it will launch later this year alongside iOS 9 and will be available in both Play Store and the App Store.